I love to watch little kids use scissors. It is always so cute the way they open their mouth when they open the scissors. We have a new pair of The Ultra Safe Safety Scissors and The 3 Step Pencil Grip Training Kit from The Pencil Grip, Inc. The Ultra Safe Safety Scissors work just like any pair of scissors and are just as easy to use. The only difference is the blade has a fixed safety shield that remains in place over the blades even while the scissors are being used. The blade on the finger side of the scissors are connected to the safety shield. The blade connected to the thumb side moves up and down inside the safety shield. The piece of paper slides in between the fixed blade and the safety shield. There is a training lever that will automatically open the scissors after they have been squeezed closed. It can also be closed so that the scissors work like normal. 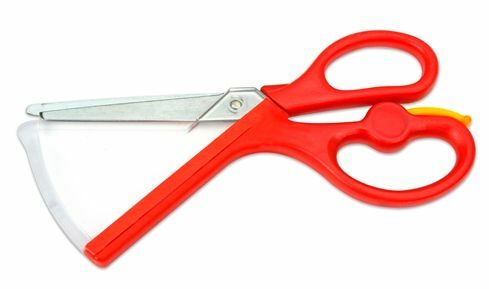 These scissors are recommended for children ages 3 and up and would be great for kids preschool supplies. The 3 Step Pencil Grip Training Kit comes with 3 different grips that can be used on regular pencils and pens. They make holding them correctly easy and comfortable for children and adults. Both left-handed and right-handed people can use the grips correctly. Step 1 is called the Crossover Grip. It is shaped like a "super hero cape" over the fingers. It is for training and provides structure and reinforcement for proper finger positioning. Step 2 is the Pinch Grip. This one has partial "wings" to allow transitioning to freedom but still has structure. By removing the "super hero wings" it allows the user to see their fingers to visually see how to hold the pencil or pen. 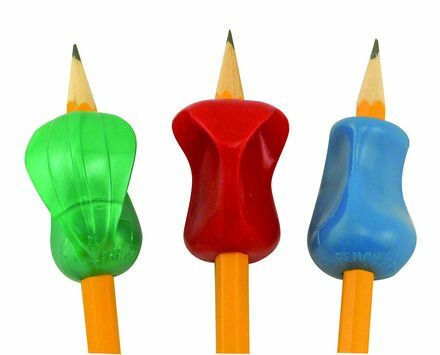 Step 3 is the original Pencil Grip. It is refered to as the Graduation because it is the last one and can be used as long as the user needs to. This step provides a lifetime of comfort and control. My son ad daughter would totally use these!!! I would use these for Operation Christmas Child Shoeboxes! These would be for my grandson. These would be for my 2 1/2 year old! She wants to learn to use scissors so bad! My 5 year old would love the pencil grips, and my 2 year old the safety scissors. I would save it for my little guy who is almost 1 and half! These sound like they would be great for my 5 year old! My son would be the one using these in our house. I have been working with my son since before he could talk trying to get him ready for preschool. Now we are getting into arts and crafts. This would be perfect !! Yes I would use these at home. We do a lot of crafts and my 3 year old could use these. I would let my daughters use these. My son would use these.